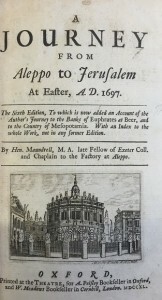 ‘A Journey from Aleppo to Jerusalem at Easter A.D. 1697’ was written by Henry Maundrell, a Church of England clergyman and chaplain to the Levant Company’s factory at Aleppo in Turkey. 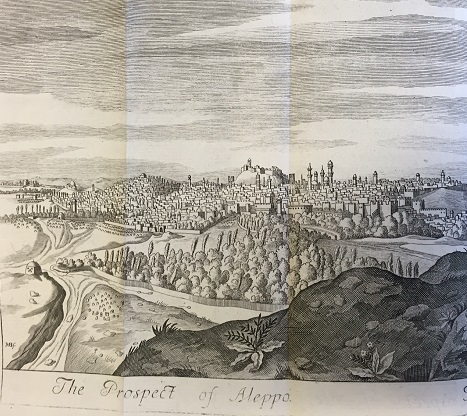 Maundrell went on a pilgrimage to Jerusalem in 1697 and the journal he produced on his journey is described as being a ‘minor classic’ (Howell, 1964) in the world of travel writing. Originally published in 1703 it reached its twelfth edition by 1810 and was translated into three different languages (Butlin, 2004). When you are tired with reading it, you may support your Patience as we did in Travelling it over, by considering, that what you are about is a Pilgrimage; that you need go it but once. Despite Maundrell’s humility and reluctance to publish his work, his friends realised its potential and were able to persuade him otherwise. Maundrell intended to submit the work with some corrections and amendments but by the time these arrived in Oxford, the first edition was almost complete. 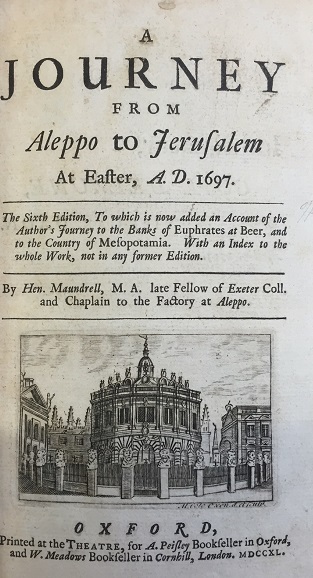 Later editions, such as our sixth edition copy, printed in 1740, do however, contain the additions. 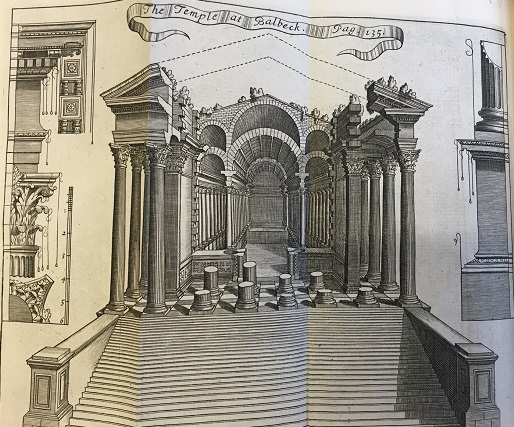 The Body of the Temple, which now stands, is encompassed with a noble Portico, supported by Pillars of the Corinthian Order, measuring six foot and three inches in diameter, and about forty five foot in height, consisting all of three Stones a piece. The ceremonies begin on Good Friday (Nox tenebrosa) with a solemn procession around the church. This begins in the dark with a sermon in Italian, then candles are lit and a large crucifix, “which bore upon it the Image of our Lord, as big as life[…]was carried all along in the head of the procession; after which the company follow’d to all the sanctuaries in the church, singing their appointed Hymn at every one.” This is followed by a symbolic re-enactment of the crucifixion and burial of Christ and a final funeral sermon in Arabic. On Saturday Maundrell provides an interesting commentary on the pilgrims who have their, “arms mark’d with the usual ensigns of Jerusalem,” giving a detailed description of the tattoo process involving needles and ink made from gunpowder and ox-gall. Finally, Easter Sunday was celebrated with a mass led by the ‘Father Guardian’ who was adorned in episcopal robes and mitre. Maundrell (a little cheekily) suggests that the joy the Friars display on Easter morning perhaps has a little more to do with the end of Lent than their celebration of the Lord’s resurrection. Although Maundrell can be critical of the places and customs he describes, his writing is often witty and well informed, it was valued by later travellers and moreover, remains an important account of the, “the life and landscapes of Syria, Lebanon, and Palestine” (Butlin, 2004) for today’s writers, travellers and historians. When you come therefore to any such Nauseous places in this Journal, you may please to pass them over with that Contempt which they deserve, but nevertheless with some indulgence to the Writer of them; for if this Vanity may be ever tolerated, Travellers are the Men who have the best claim to that Favour.